Narrated by David Attenborough, Netflix's most recent series aims to celebrate what natural wonders remain on Earth and reveal what we must do to ensure that people and nature thrives. It begins by showing incredible and captivating footage of each biome and the living creatures that occupy them. It teaches us amazing facts along with important statistics that emphasize just how connected everything on Earth truly is. 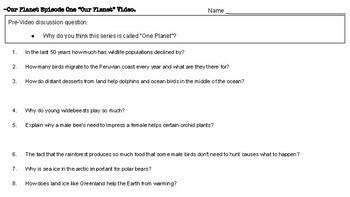 This video & worksheet help students understand and think deeply about these major concepts. 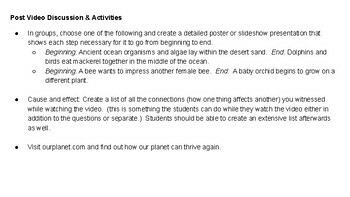 Students will be engaged by the jaw dropping footage, fascinating concepts, and of course David Attenborough's attentive and inspiring narrative. 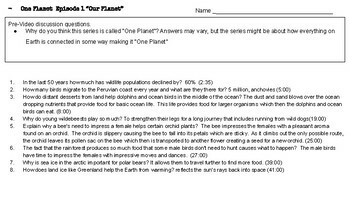 The worksheet includes post video discussion & activities, as well as, an answer key with time stamps.